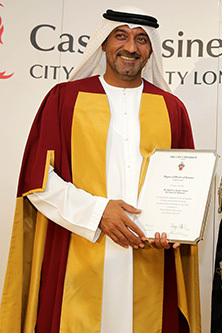 His Highness Sheikh Ahmed Bin Saeed Al Maktoum was given an Award of Doctor of Science honoris causa by City in 2013. His Highness Sheikh Ahmed first became involved in aviation in Dubai in 1985. Today, the industry accounts for 28% of the city's GDP. Under his leadership, Dubai International has developed into the world's 2nd busiest airport for international passengers and 3rd busiest for international cargo. His Highness Sheikh Ahmed Bin Saeed Al Maktoum was honoured in recognition of his outstanding leadership and entrepreneurship in the development of professional sectors in the United Arab Emirates. His Highness Sheikh Ahmed is President of the Dubai Civil Aviation Authority, Chairman of Dubai Airports and Chairman & Chief Executive of Emirates Airline & Group. Over the past 25 years, His Highness Sheikh Ahmed has been at the forefront of Dubai's remarkable economic development - notably spearheading the successful expansion of aviation. More recently, he has been involved in formulating economic, investment and fiscal policies and strategies in support of the Emirates' overarching vision. 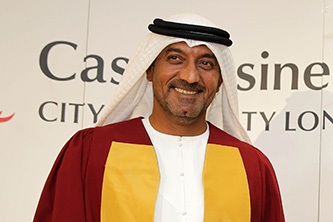 Educated as an undergraduate at the University of Denver, Colorado in the US, His Highness Sheikh Ahmed embarked on his journey in the aviation industry in 1985 when he was appointed President of the Dubai Department of Civil Aviation. In recognition of his significant contribution to the sector, the Royal Aeronautical Society honoured His Highness Sheikh Ahmed with a fellowship in 1994. He also holds honours from France (Commandeur de l'Ordre de la Legion d'Honneur) and Germany (Verfassungsportugaleser). Alongside his numerous business activities, His Highness Sheikh Ahmed holds several government positions and is patron to many charities.